The newest iteration of Fiddlefreak favorite Foghorn Stringband is the fooktastic Foghorn Trio, with Stephen ”Sammy” Lind on fiddle, banjo, guitar and vocals, Caleb Klauder on mandolin, guitar, fiddle and vocals and Nadine Landry on guitar, bass and vocals. Although these three have recorded together on previous occasions, their first full-length collaboration just hit the streets, titled Sud de la Louisiane. Its unassuming packaging belies what lies inside the simple cardboard envelope: 14 tracks of joy that range from heartland fiddle to Cajun heartbreak to old-school honky-tonk heaven. Much has been said about certain urban revivalists that resurrect and even profit from the music of a culture to which they are outsiders. Well that ain’t Foghorn. I know nothing about the heritage of the Trio, other than the fact that Sammy saws a fiddle tune that could beat the devil, Caleb totally owns every song he sings, and Nadine has some deep French-Canadian family links. And the truth is, I don’t give a flying flock where they come from. In my book, when you play your music well enough to help define the genre, you’re IN. That’s exactly what Foghorn Trio does for traditional American folk music. Sud de la Louisiane will float you down a big muddy river to a red-hot front-porch pickin party that goes on all night. 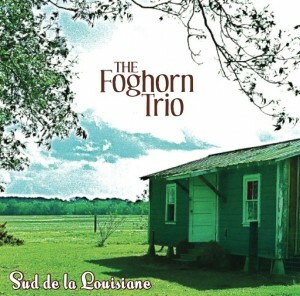 The CD was recorded in Eunice, Louisiana by Joel Savoy at Studio SavoyFaire. (The picture on the cover shows Joel’s studio, which occupies the former home of his grandfather’s cook shack.) Get this CD, sit back in your rocker and enjoy a satisfying slice of bona fide old-time Americana. Great oldtime singing and a great band.